If you have done your due diligence and are reviewing at least three bids for vinyl siding costs, you might be wondering why there are discrepancies. There are many things necessary to keep a contractor's business running and all of those things get passed along to the consumer. What Goes into a Vinyl Siding Estimate? Mostly lumped into "overhead," contractors need to employ people to keep the business running and to stay competitive. Even though the receptionist won't be installing your siding, you better believe her salary and her benefits are paid in your vinyl siding costs. The same goes with the workers who come and install your project. In addition, not only does the contractor need to pay insurance to cover anything that might go wrong on the job, the contractor is probably paying for worker's compensation insurance to cover anything that happens to the employees on the job. Does the contractor supply full or partial healthcare insurance to the employees? Vacation pay? Sick-pay? It all gets factored in the contractor's "overhead" and those costs are recouped when they write your vinyl siding estimate. That doesn't even touch on the cost of equipment, work trucks, gasoline, office rent, and so on. If you feel you are comparing contractors who are very similar and there are still discrepancies, that might have to do with how much volume they do. One contractor might have two or more homes (yours is one of them) all installing the same vinyl siding. Based on the amount of materials they order, they might have a volume discount on the materials. Ask for references! Not all vinyl siding estimates are equal. Find out if the winning contractor adds charges throughout the process. Be knowledgeable and shop smart. Your best bet will be the contractor with the best reputation, regardless of cost. 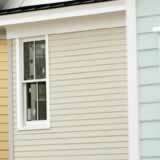 Vinyl siding: Which brand is right for your home? What Can You Expect to Pay for a Vinyl Siding Job?